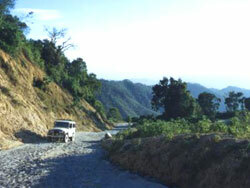 El Pital is located at 93 km to the north of San Salvador, at 7 km from San Ignacio, in the department of Chalatenango. El Pital is one of the national parks where we can enjoy the climate, vegetation and amazing views with no need to request permission in advance; one fee entrance is required though. 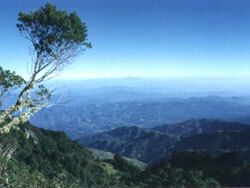 El Pital rises at 2730 m above sea level - the highest point in El Salvador. Many outdoor activities can be carried out like: bird watching, trekking, mountain biking, camping, etc. or simply enjoying the view. You can see most of the volcanoes in the Eastern and Central zone of the country, in addition to the city of New Ocotepeque in the sister republic of Honduras. This is an area with a cloudy microclimate. The variety of orchids growing here is impressive due to the perfect climate: high concentration of humidity and abundance of vegetation. Local people have the particularity of being white skinned, green eyed and most have blond hair; whereas in the rest of the country the color of skin, eyes and hair is different; all these due to the settlements and mix of races during the conquest. El Pital is one of the best places for camping, which is if you enjoy cold nights inside a tent. Some new hotels have recently been built if you need more comfort, among them "El Pital Highland", on the road to the top of the mountain.